Happy post-holidays friends – I hope everyone had a good one! Before we move onto the new recipe, I’m going to quickly talk about some pastry machinery I had the pleasure of being shown over the short holiday period. It was unreal! It was a tartlet baking machine that could bake up to 30 tartlets in one sitting. It was so consistent and all of the tartlets were baked to the same perfection. If I had the money and time, I would definitely love to invest in one, it would make life so much easier! Anyway, moving away from the tartlet machine, I’m guessing you might have some leftovers hanging around? And maybe even some guests? If so, this new recipe would totally be super easy to whip up for a casual weekday brunch. I really love having guests stay over – everyone hangs out in their pajamas and gathers around the kitchen for cups of coffee. There’s definitely something super-cozy about it. 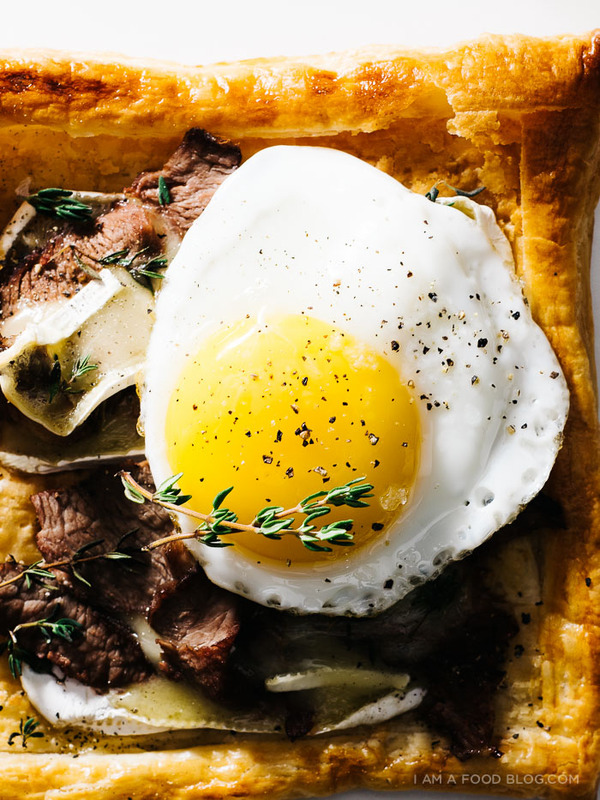 What’s even cozier are these super easy breakfast tarts. 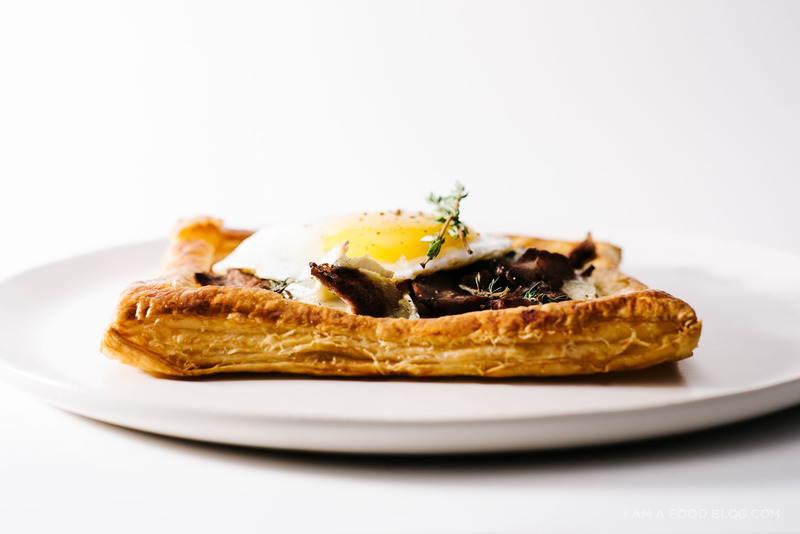 The night before, defrost your puff pastry in the fridge and make sure you have some leftover meat on hand. I used roast beef (or as I like to call it, roast beast! ), but you can feel free to use whatever you have. Turkey would be awesome and of course bacon is always a favorite, but really, who the heck has leftover bacon?! Of course, you could fry up some bacon, but that would involve another step and in the mornings the fewer steps the better. When you wake up, cut the puff into pieces, light score and par bake, top with toppings, and then pop the tarts back into the oven to melt the cheese. While all that’s going on you can fry up some eggs or make coffee. Or maybe just look desperately at the person who makes your coffee for you. Whatever works! Happy Sunday Friends! 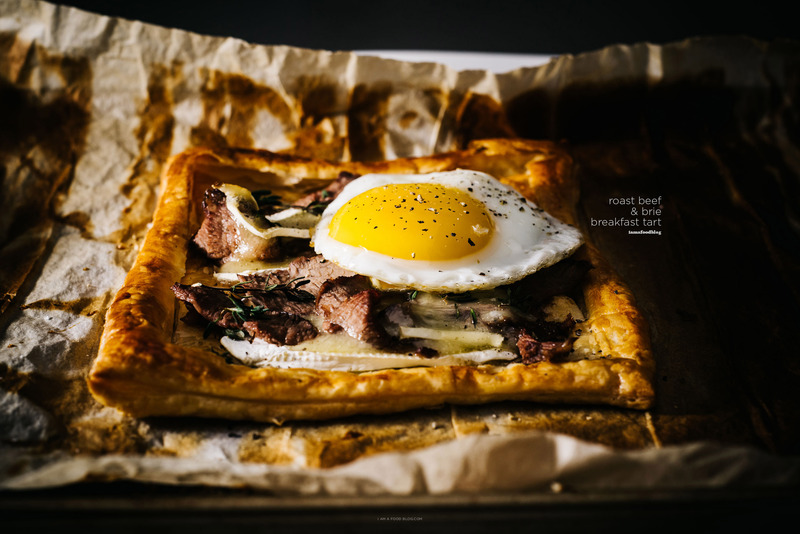 Slice the puff pastry sheet into four pieces and use a sharp knife to cut a 1/2 inch border around each square – you don’t want to cut all the way through the pastry, you just want to score the pastry so it creates a frame when baked. Use a fork and poke inside the border to prevent too much puff. Place the pastry on a lined baking sheet and brush the edges with the egg wash. Bake for 15 minutes until slightly puffy and lightly golden. Remove the puff from the oven and brush with mustard and top with slices of brie and roast beef. Sprinkle on some fresh thyme and return to the oven and bake until golden and brie is melty, about 5-8 minutes. Remove, season with salt and freshly ground pepper and enjoy immediately. 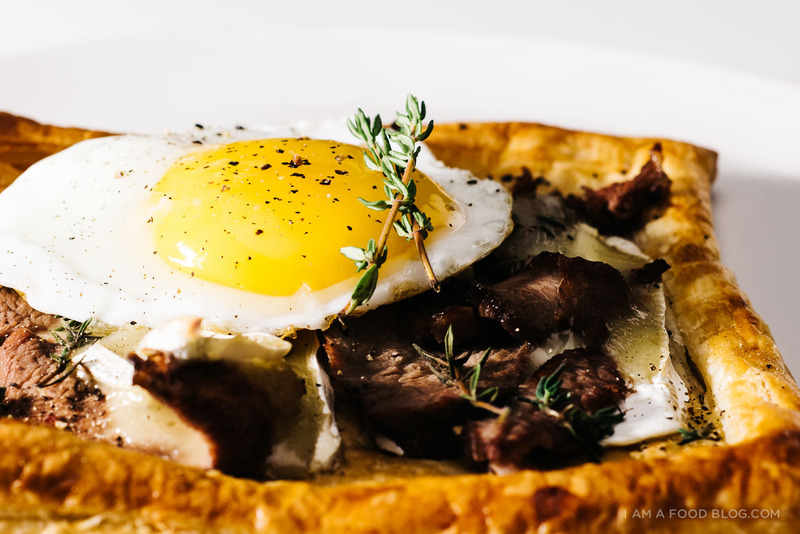 *If using eggs, fry the eggs while the puff pastry goes into the oven the second time around. PS – Follow my blog with Bloglovin! I just joined! 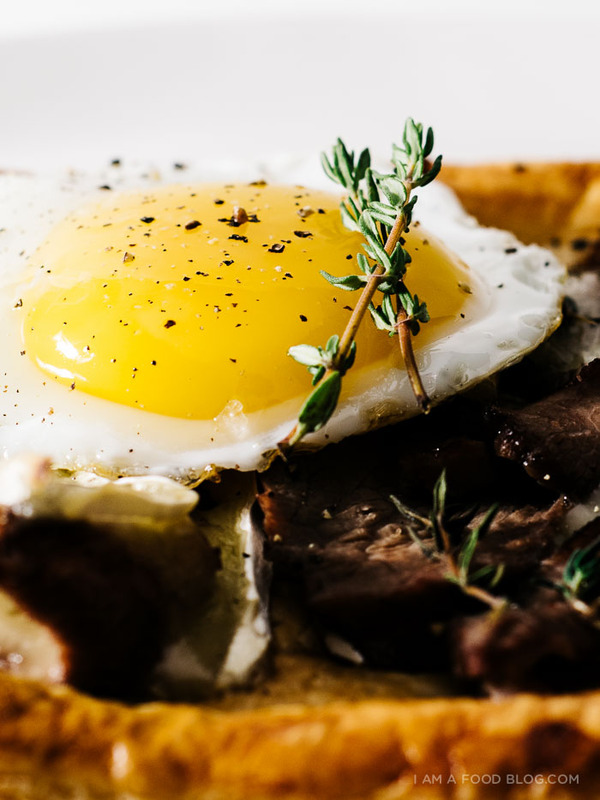 This looks super easy + delicious + definitely a perfect brunch for the holidays. happy holidays to you! Not only do they look delicious but SO CUTE! I just love your Sunday brunches!! Next time I have guests this is on the list! Non-stick pan heated up on high-heat then turned down to medium-low. I always crack my eggs into a tiny dish before gently sliding them out. After that I basically don’t touch them until the whites cook through and the yolks stay runny. Hope that helps! 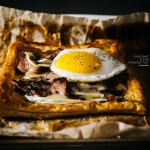 Love how easy yet delicious these beef and brie puff tarts are.. I totally can see myself making these and devouring MANY. That looks phenomenal. I may have to try it this weekend! OK DAMN. I’m Loving this! ok where has this been in my life? puff pasrty anything but savoury? so good! 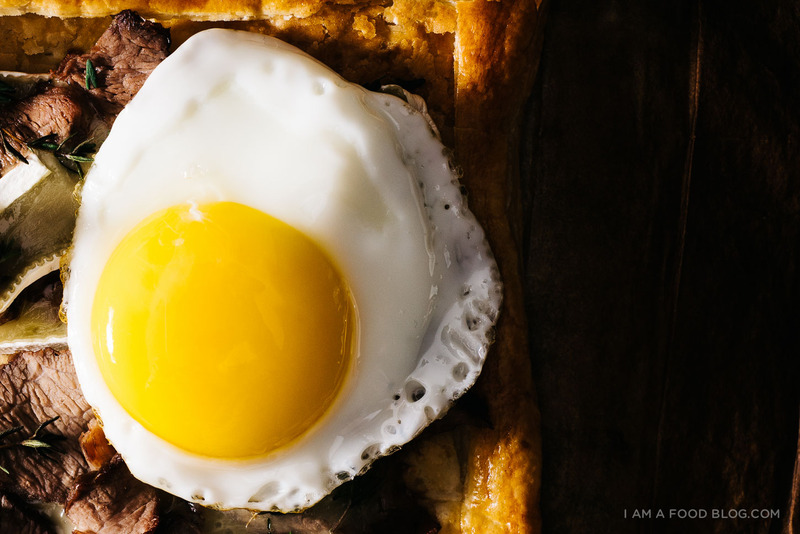 Isn’t everything sooo much better topped with an egg? I will have to try this!